Wawona Campground is located in breathtaking Yosemite National Park in Central California's rugged Sierra Nevada Mountain Range. The site is situated at the southern end of the park, 27 miles and 45 minutes from Yosemite Valley, at an elevation of 4000 feet. The area is forested with a diverse mix of ponderosa pine, incense-cedar, white fir and white leaf manzanita, which offers a pleasant combination of sun and shade. The gentle South Fork of the Merced River flows alongside the campground. Yosemite's trails, cliffs, roads, and rivers provide endless recreational activities for any kind of visitor. Hiking, biking, rock climbing, fishing, horseback riding, rafting, auto touring, and photography are all very popular activities within the park. The Pioneer Yosemite History Center is like stepping back in time. A visit to the Mariposa Grove of Giant Sequoias, just four miles away, is a must-do. A guided bus tour (tickets must be purchased) and a network of hiking trails within the grove leads to stately trees with names like Grizzly Giant, Faithful Couple, and California Tunnel Tree. 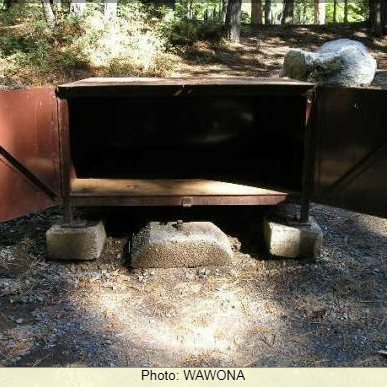 Wawona offers several additional hiking trails, including the Wawona Meadow Loop, Swinging Bridge Loop, Alder Creek and Chilnualna Falls. 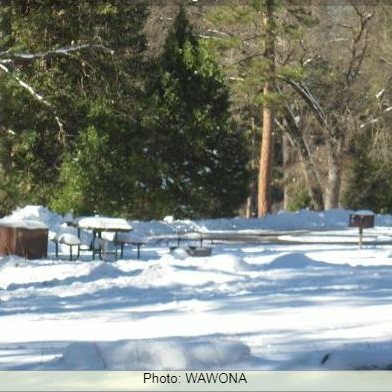 Wawona Campground offers family, group and horse campsites. Paved roads and parking spurs, flush toilets, vault toilets and drinking water are provided. Each campsite contains a picnic table, fire ring and a food storage locker. A general store and gas station are located near the Wawona Hotel. Just 45 minutes away is Yosemite Valley, an awe-inspiring landscape containing many of the famous features for which Yosemite National Park is known. Hiking trails and bike paths are abundant in the valley. Rafting the Merced River is a fun way to cool down on a summer day when water levels are sufficient. Yosemite Valley also offers numerous guided bus tours, educational programs, museums, ranger-led activities, and an art center with workshops. A scenic 45-minute drive leads to Glacier Point, with its sweeping views of Yosemite Valley, Little Yosemite Valley, Half Dome, Vernal and Nevada Falls and Clouds Rest, among other notable landmarks. The Tioga Road, in the central region of the park, offers a 39-mile scenic drive past forests, meadows, lakes, and granite domes. Tuolumne Meadows embodies the high-country of the Sierra Nevada, with its broad sub-alpine meadows and granite domes and peaks. Beautiful Hetch Hetchy Reservoir is home to spectacular scenery and numerous wilderness trailheads.